Although she lives in the human world, away from a city inhabited by daimons, Mallory is still in danger. Daimons and witches are mortal enemies, and both want to use Mallory as a pawn in their war against each other. Kaleb is the daimon who’s been sent to find her. Back in The City, Kaleb is also a contestant in a fight-to-the-death tournament that could mean escape from his low-caste status if he wins. First, though, he’ll have to defeat fierce competitors like Aya, for whom the tournament represents the only way for her to obtain a voice in The City’s council. Both Aya and Kaleb desperately want to emerge victorious, but their connection goes beyond being rivals in the tournament. The two daimons are also connected by Mallory and the plots centered around her that both the witches and the daimons are planning in order to eliminate one another. After finding Wicked Lovely, the first book in Melissa Marr’s fey series of the same name, on the underwhelming side, I was iffy about reading Carnival of Souls. Curiosity, prompted in large part by the dramatic cover, got the better of me, though, so I decided to give it a try. 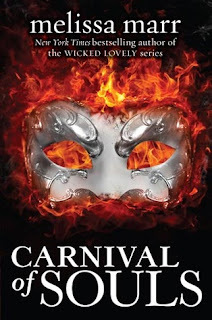 I wasn’t sorry; Carnival of Souls turned out to be quite a compelling read about daimons locked in a battle against witches, and in one plotline, against each other. The book focuses on three main characters: Aya, Kaleb, and Mallory. Their plotlines intertwine, and I was impressed with how Marr brought them together. I found Aya and Kaleb’s stories thoroughly absorbing. Kaleb is a low-caste daimon hoping that victory in the tournament held by the The City’s ruler, Marchosias, will elevate his social status. Aya was born into daimon nobility, but all a highborn female has to look forward to is marriage and children. She actually wants to improve life for her kind, and for her, winning the tournament is the only way to gain a seat on The City’s council and a say in its affairs. I really liked seeing things through the eyes of two characters from opposite backgrounds; it was very effective in conveying the determination that both characters shared despite how vastly different their castes were. To me, the weakest storyline in the book was Mallory’s. I thought that she was the least developed of the three main characters, but it was mostly due to the circumstances surrounding her upbringing. Adam, her adoptive father and a witch, has only told Mallory enough about daimons so that she knows how to defend herself against them. For the most part, Mallory is ignorant of the world that her daimon mother fled and has been sheltered from the world in general by Adam. Mallory is rather naïve, and her personality contrasts quite a lot with that of the fiery Aya, but I don’t fault Mallory for that considering how she has been raised in such a protective bubble. One area of the novel that I found lacking was the world-building. I had the same problem with Wicked Lovely, the feeling that I’d joined the story in progress. With both books, I wouldn’t have minded some additional exposition to give me a clearer picture of the worlds. I’m still puzzling over what exactly a Watcher is in Carnival of Souls and why some of the daimons in The City wear masks. Some sketchy details here and there didn’t lose me completely, but I couldn’t help but think that had they been filled in, they would have nudged this book’s rating up to a solid four stars. On the whole, I’m glad that I took a chance on reading this. Aya and Kaleb really drew me into their stories, and I would definitely read a continuation of them. This was a pretty thrilling read, with a significant amount of conspiring and backdoor dealing going on, not to mention the vicious fighting taking place in the arena during the daimon tournament matches. While it occasionally seemed like the specifics of the world had been glossed over, the main story lines didn’t suffer because of it and were tightly focused. I liked Wicked Lovely, but the second book in the series was a pretty big disappointment. However, I’ve long been impressed with Marr’s ability to write strong female leads, and Aya, as you describe her, sounds great and definitely worth reading about. I've thought about giving the 2nd Wicked Lovely book a chance, but I think I'll leave it alone, then. I liked Aya a lot- very strong and determined. I hope so, too. I really liked the book, which I wasn't sure I was going to, and probably would have loved it if the details of the world had been explored a little further. This one sounds intriguing but missing background to a story is one of my pet peeves! Mine, too! I need just the right amount of info so I'm not lost, but not too much where it's an overload. I'm quite picky, lol. At first I thought that Mallory was going to be tough because of all of that fighting training, but when the daimons went after her, it wasn't very helpful. I wish that Mallory had been a little more like Aya, or that her storyline had been part of Kaleb's POV instead of her having her own. I find it hard to write the 3 and 3.5 star reviews because in my head, I know why I've given a book that rating, but it's difficult to put across in words why I liked the book, but not enough to overwhelmingly recommend it. With this one, I think it's the kind of read that you might want to just take a chance on to see if it's for you. I have a bit of a love/ hate relationship with Marr. I've thought about reading this one to see if pushes me back to the love column but I'm thinking it may sway me the other way. Especially if there are holes. Eek. I'm in a similar boat with her books. Wicked Lovely wasn't really my cup of tea, but I liked this one a lot better, even with the spotty world-building. Although I haven't started reading Marr's Wicked lovely books I think that Carnival of Souls is a good book to start with for those who haven't read any of her literary works yet. Aya's awesome! I liked her so much better than Wicked Lovely's Aislinn, whom I found rather whiny.